WASHINGTON, DISTRICT OF COLUMBIA, December 22, 2017 — Dogs have long been called Mankind’s best friend, but a major new scientific study now indicates that a dog may also be a family’s best friend in times of their greatest need. Following seven years of pioneering research, American Humane, the country’s first national humane organization, revealed the results of its long-awaited “Canines and Childhood Cancer Study,” the first and largest randomized, controlled clinical trial to rigorously measure the effects of animal-assisted therapy (AAT) in the field of pediatric oncology. The results, published today in the Journal of Pediatric Oncology Nursing, furnish evidence that regular visits from a therapy dog can provide significant psychosocial benefits to families of children undergoing treatment for cancer. The data indicates positive effects on parents, including improved communication within families as well as between parents and medical staff, which can lead to better medical care, and reductions in their levels of stress, specifically as it relates to their emotional functioning. For decades, there have been tantalizing stories about the power of animals to bring comfort and help in the face of illness. And while studies have suggested the benefits of AAT, the majority of these findings have largely been anecdotal and have lacked scientific rigor, thus hindering the ability of AAT to be recognized by those in the research, funding and healthcare fields as a sound treatment option. Additional key research gaps – such as the impact of AAT on therapy animals – also exist, which rendered AAT best practices incomplete. Comprehensive Needs Assessment (launched in 2010): The research team conducted a comprehensive literature review to determine the current state of research in the fields of animal-assisted therapy and pediatric oncology, as well as focus groups and interviews with pediatric oncology patients, parents of children with cancer, hospital staff, and animal-handlers who visit with their therapy dogs in pediatric healthcare settings. Collectively, these findings shaped the rationale and ultimate goals of the study, culminating in the full clinical trial. Read the literature review here. Pilot Study: Next, we executed a pilot study (data collected between January and June 2013) at two hospital sites (East Tennessee Children’s Hospital, in conjunction with the University of Tennessee’s College of Veterinary Medicine, in Knoxville, Tennessee, and St. Joseph’s Children’s Hospital in Tampa, Florida) to help inform the design and implementation of the full clinical trial. You can read the pilot study report here. Full Clinical Trial (data collected between January 2014 and September 2016): Third and finally, American Humane conducted a full clinical trial at five sites across the country: St. Joseph’s Children’s Hospital in Tampa, Florida; Randall Children’s Hospital at Legacy Emanuel in Portland, Oregon; UC Davis Children’s Hospital in Sacramento, California; UMass Memorial Children’s Medical Center/Cummings School of Veterinary Medicine at Tufts in Worcester/North Grafton, Massachusetts; and Monroe Carell Jr. Children’s Hospital at Vanderbilt in Nashville, Tennessee. The research study followed 106 pediatric patients newly diagnosed with cancer, including 60 who received regular visits from therapy dogs (the treatment group), and 46 who received standard treatment (the control group). Children in the treatment group received 20-minute sessions with a therapy dog about once a week for four months, in addition to their standard care. The patient population was children, age 3-17 years, who were newly diagnosed with cancer and who received regular chemotherapy treatment in the outpatient clinic. The study employed a range of physiological and/or psychological measures to assess stress, anxiety, and health-related quality of life among patients and their parents. The researchers found no significant differences in overall stress and anxiety for children and parents or in children’s HRQoL between study groups. 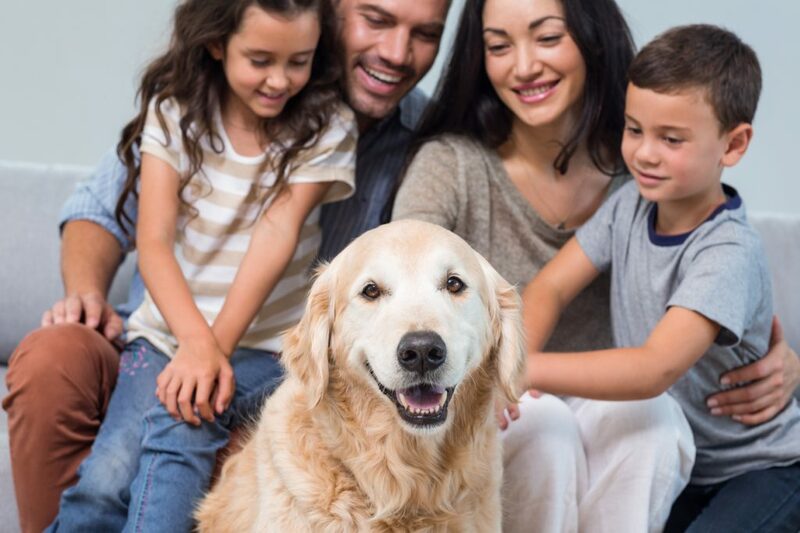 However, data indicated that disease-related worry and anxiety among patients who had regular visits from therapy dogs remained stable, while children in the control group became significantly more worried over the course of the study. Additionally, parents in the treatment group reported that their children had significant improvements in school functioning. As a humane organization, American Humane researchers also worked to gauge the effects of such interventions on the therapy dogs themselves, measuring the level of the stress hormone cortisol in the dogs’ saliva after visits. The data show that participating therapy dogs showed no signs suggesting that the activities caused distress or harmed the welfare of the animals. Funds to study the effect of therapeutic visits on the therapy dogs themselves were received through a grant from the Human Animal Bond Research Institute (HABRI). These findings are published here in Applied Animal Behaviour Science.